In the year 2003 I found a valuable treasure while teaching kids yoga. It was a few minutes before ten a.m. when I came into the daycare and the energy was high. The kids were sitting in their little chairs finishing snack, crumbs spread over floors and faces. Seeing me, the teachers gave the kids a 3 minute warning and started one of the many clean ups of the day. I had no idea I was about to discover a wealth that would change my teaching from that day forward. I have Emily (yes – her real name) to thank for that. I’m not sure where Emily is now, she was about four then so I guess she’s about nine years old now. I hope she still does yoga because she really did love it. Emily loved yoga so much that she was always one of the first ones to sit in the circle. 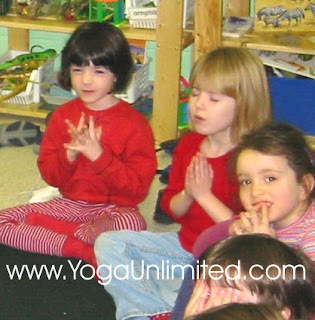 As the other kids sat down, and a few of them put up a fuss, I saw Emily start doing her favorite meditation. I sat down beside her and joined her. We sang/chanted the meditation out loud for about 1 minute and without any other words, the group got together and joined in. Without a single piece of direction or advice every kid got ready by themselves. This was yoga teacher ecstasy. From that moment on this became my map to get kids attention. Meditation became my new best friend! In my class when you hear chanting it’s time to get back in the circle and join in. I do it at the beginning, middle, and/or end of class. Any time things start getting too lively, there’s me and meditation, my BFF. It’s a win-win solution, I relax and the kids relax too. You will be amazed how much kids like this. So much so that it became the routine in Emily’s class, a ritual that lasted till the end of the school year. Then Emily graduated to the big school. I never did thank Emily for this gift, but I think she feels it in how much I have appreciated it. Welcome, I’m glad you found the blog. Teaching kids is amazing, profound, and also takes alot of energy (as you know from parenting)! My neice used to do her mom’s yoga videos all the time and really liked the kids yoga books. I’ll be posting some yoga poses for kids to do as well. Feel free to leave any questions you have. Sat Nam Sarah – thanks for leaving a note. I put a comment on your blog. 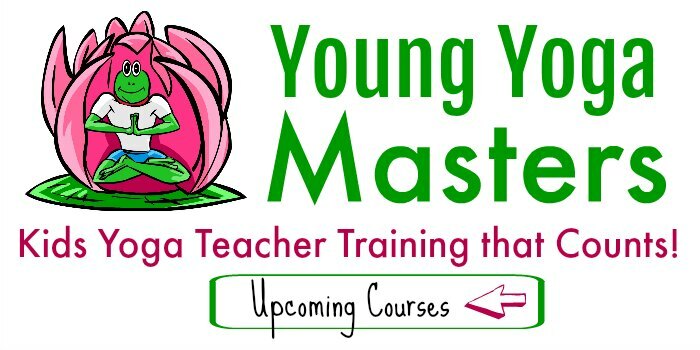 I loved your post about our last class on Monday. You’re an awesome writer and computer gal! I have some more great pics of you to put up on the blog. Hi Kelcey (Mama Bird) – thanks for visiting the blog and such a cute story of your daughter. I love when they think of it themselves – kids are so great at just doing the yoga/meditation any time. Great blog!! I’m fairly new to yoga, but am toying with the idea of eventually becoming certified to teach it. I think teaching kids would be so amazing!! My kids are a bit older (8 and 11) but they’re observing me with much interest — I hope to get them hooked. 🙂 I wish we had children’s yoga in our area!! Hi, its Sarah i see the pic of me!!!! It always calms us down.